Nose: Fresh cut grass, honey, peat smoke, and mixed citrus peel. Hints of dried apricots and dry apple chips. Palate: A big peat smoke impact here, some cured meats, beach water and the mouthful of seaweed you get when dumped in the surf. Hints of fresh and sweet botanicals. Fairly medicinal, but not overpoweringly so. Mouthfeel: Reasonably thick, but not chewy or creamy. A small alcoholic tingle that sits on the tip of the tongue, but goes no further. Somehow it seems to fill the whole mouth – up to the roof of your mouth – whilst it goes down your throat. Finish: Not a powerful finish, but the smoke hangs around for quite some time. This whisky is a blended malt (AKA a vatted malt) whisky – that is it’s a vatting of malts (no grains) from multiple different distilleries, and has been blended under the direction of Compass Box’s founder and head blender; John Glaser. The current Peat Monster is 40% Laphroaig spirit, 26% Ardmore, 20% Ledaig, 13% Caol Ila, and 1% made up of spirit from Clynelish, Teaninich, and Dailuaine. The whiskies were vatted together for their final two years in a hybrid American oak and French oak barrels, and bottled at 46% ABV with no colouring, and is non-chill filtered. 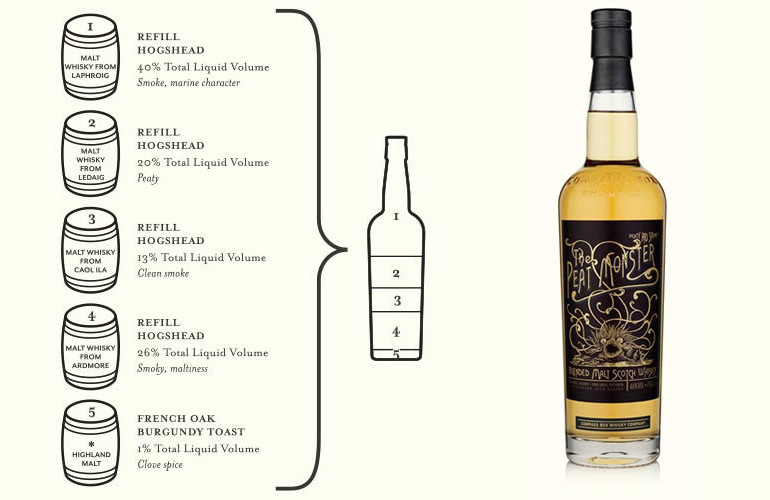 Blending peated malts from different Scottish regions is not a simple task, and is a task that many have failed at, but Compass Box has done an excellent job with The Peat Monster. The peated offerings from the Speyside distillery of Ardmore, Ledaig from the isle of Mull, and Laphroaig and Caol Ila from the isle of Islay, have married together seamlessly. I’m not a big drinker of blended whiskies (malt, grain, or mixed), but The Peat Monster could convert me. I sincerely doubt this bottle will be my last. The Peat Monster is one of several blends from Compass Box that has landed them, and John Glaser, in the news a few times lately due to the company publishing details of the components that make up the bottling – which is against the law for Scotch whisky. John Glaser, and Compass Box, has since started a campaign to allow Scotch whisky producers the option to publish details regarding what they put in the bottles that we buy. Other distillers, such as Bruichladdich and Tomatin, have publically joined Compass Box in their transparency campaign, with Ronnie Cox (who is the brands heritage director for The Glenrothes and other brands in the Berry Bros & Rudd stable) having lent support vocally to the aims of the campaign. You can read further on my thoughts on transparency in Scotch whisky here.